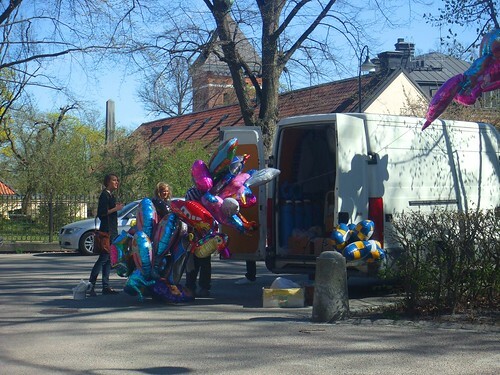 On Saturday we had Lisa’s bachelorette party~ Jenny, Josefin, Sofia, myself and of course Lisa were there~ Also featured were “balloon” people of Suyin and Lisa’s friend’s Mika and Alex. It started off with all of us (sans Lisa) meeting at Jenny’s place and preparing food, balloons and drinks for the day. After all was prepared we went to the forest and set up, Jenny and Josefin went back to get Lisa while Sofia and I stayed put and set up the giant Ludo board, the balloons and our general area up on a little mound in the forest free of pinecones. Soon after Jenny and Josefin came back with a blindfolded Lisa all decked out in a princess tiara, an obnoxious purple flower on her arm and a shirt that said “Future Mrs. Frisell” in Swedish. Lunch consisted of crackers, cheese, strawberries, and sparkling…something or other…which was also used to make Jenny’s lime drink. Dangerous! After awhile we played Ludo…which took quite sometime and Lisa was the victor! We were exceptionally lucky with how nice it was, though a bit too hot outside. I never thought I would say 75ish degrees was ridiculously hot. It wasn’t even humid! Shows how much I’ve changed in that regard. After that we packed up and went to Jenny’s for some chocolate fondu fun!! Which was delicious as you can imagine, come on…chocolaaaate~~ We cleaned up a bit and even did face masks aaaand then got ready to go out to dinner~ The face mask was fun for me because I haven’t done it before and it was the peel-off face mask…which was fun…because peeling off your face is always fun! Well, a lot actually has happened since I last wrote, I’ve just been too lazy to actually write. I’m basically done with my classes now, as I dropped my final one because it was just…ridiuclous. Masters work for an undergraduate ELECTIVE? No thanks. So, earlier this week I stayed at Vanessa’s house in Stockholm and we worked out our final paper for “Image, Identity & New Media”. I’m really pleased with how it turned out! If we get anything less than an A I’m going to be super upset. But, it wasn’t all work and no play…well it kind of was but haha. Anyway, we went to the park with her son and it was actually a lot of fun. He’s opened up to me a lot compared to a week or so ago when I went to visit her. So, while Vanessa talked with her friend I just took Oscar around to see some of the animals. He’s really a well-behaved kid and quite amusing haha. But, a strange thing about Sweden is that they have a petting zoo at the park and anyone can go! No paying to go pet and see the chickens, rabbits, sheep, goats, etc. It’s strange~! But, so nice. Another thing I noticed that there were lots of toys by a sandbox and no one seemed around so i was like, “Why would someone just leave their stuff?” and Vanessa told me that it’s community toys. Kids can play with them there but they leave them there at the end of the day. I know if those same toys were at a park at home they would be jacked that night. Aaand now onto better stories! 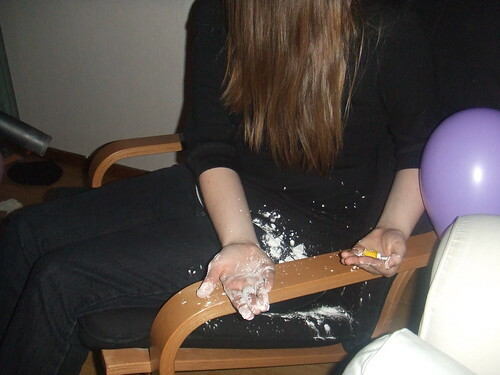 Last night was Valborg (April 30th) Find out more here. I’ve never seen so many people in one place in all my life, especially not in Uppsala. 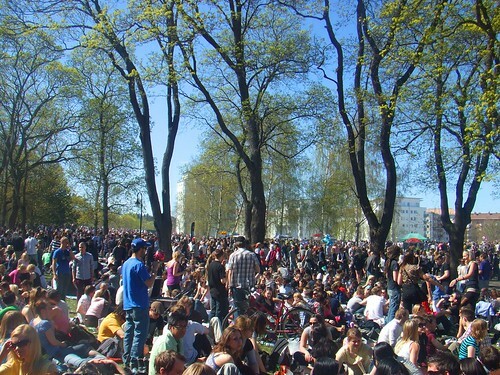 Basically Uppsala is infamous for being THE place to be for Valborg, so how lucky for me to live here? We planned on the 29th to get up at 8 for Champagne breakfast, which Sanna and I did but everyone else slept in or started making it to the kitchen around 8:30~9 which was fine. Even Jonatan came back from Katorsgatan to be there. Keke~ Fun. After breakfast Sanna, Jonatan and I walked to ICA Maxi and Systembolaget to pick up some stuff for the day. I even bought a little blue blanket to sit on which by the end of the day was not such a good idea because the fuzzies got all over my shirt when I wrapped it around me at night because it was chilly. Cruel! Theeen we eventually migrated to the river, which is where we should’ve gone all along! I love sitting by the river haha. Anyway we drank a bit more, chatted and even Suyin showed up! 😀 So after that we walked back to Flogsta and met with some corridormates and all that fun stuff. I noticed then that I had a lovely sunburn on my arms and since I was wearing half-sleeves it will be…attractive Im sure. Hopefully not too dark. Also got burnt a bit on my face, but whatever! So we all hung around until we were allll so tired that we had to go pass out in our beds. I don’t know how I forgot to write about mine and Lisa’s birthday party! We had one on the 14th of March to celebrate both mine (March 2nd) and her (March 7th) birthdays! It wasa lot of fun and basically a birthday party for 5 year olds, because we didn’t want to get old! 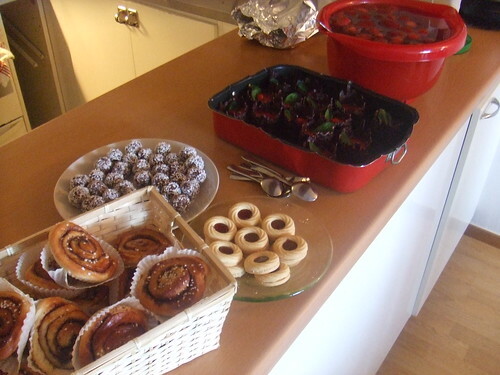 Lisa and Suyin whipped up a lot of tastey things for fika, chokladbollar will forever be the best desserty food. Aaand Suyin’s mousse-chocolate-raspberry things looked like candles..it was amusing. So it was definitely random and Lisa’s friend Anna was there who reminds me so much of Renee…well by appearance anyway, not in personality. It was kind of creepy! Aaand Josefin, Jenny and Peter were also there. 😀 Jenny got me this annoying pink bird that I bothered everyone with aaand Lisa and Peter got me this adorable cute pink bear <333 Loved them~ So much pink! We then proceeded to play childish games like pin the tail on the donkey, crazy dangerous chocolate game, and we had a fish pond later that evening as well. Suyin actually used the Flip video camera my mom got me for Xmas to record some of the antics. Here’s part of pin the tail on the donkey and the dangerous chocolate game. We watched Open Season 2, which I must say was quite hilarious! I was surprised, I didn’t watch the first one…but this one was amusing. I could see Hallie liking a movie kind of like that haha. In the evening we also played some Mario Kart and watched Melodifestivalen, which is basically the show which chooses Sweden’s contestant for Eurovision which begins in May. Eurovision is KIND OF like a full on Europe version of American Idol, except Eurovision has been around longer…I bet AI was stolen from it. Anyway, this really famous (I guess?) opera singer won by singing a french song. Very strange, considering she will be representing Sweden. It was a really amusing show. Throughout it though we were being silly and talking, eating candy from the “fish pond”, throwing these balloons filled with flour that had faces on them. Speaking of which, I exploded one of those on me. It was sad. SUPER SAD. 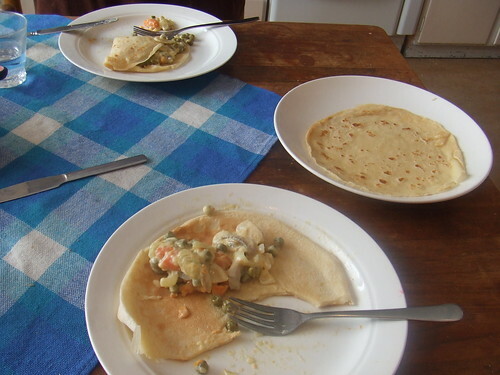 Today I went over to Miriam’s and we had delicious home-made…well Miriam-made pancakes~! I’ve only had them with jam and whipped cream, but she made some veggie mixture for them and they were amazing~! It seemed very simple…so I think I’ll attempt to re-create the amazing pancaaakes~ I need to find out what kind of peas she used though, because they were the good kind that I like *-* No pea soup today though, but the pancakes were defnitely filling enough. We had some with raspberry jam at the end. Soooo good. I swear, I could live off of pancakes. When I get home I’m going to bring PANCAKES and fika as a verb with me. So friends, we shall fika and have pancakes on Thursdays! Aside from this, I’ve done nothing else productive today. Chatted a bit with Sanna, Fredrick and his friend Andrea in the kitchen. But other than that, it’s been pretty uneventful. I’m ready for spring to come~ I walked home from Miriam’s place because it was “warm” (2 degrees haha…er…*googles* 35.6F) and mid-trip I remembered how cold it actually was because my ears and jaw started to hurt. Oh well, it was refreshing~ I can’t wait for spring! After lunch we went to this little bookstore with Swedish children books. I was tempted to buy some, because…you know I could read some of that! They also had a bit of Pippi things, which makes sense…this IS Sweden after all. I remember watching Pippi when I was younger, it was such an entertaining show! 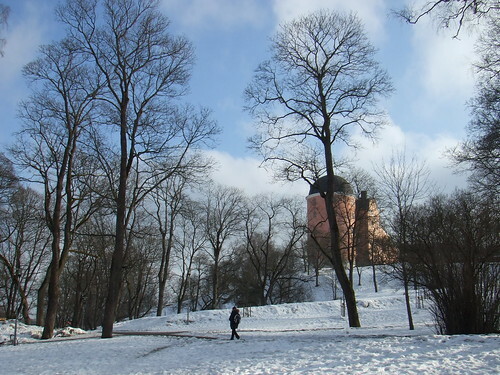 After that we went to the hill infront of Carolina R. I was really happy it was a nice day. It was “warm” and you could see the sky through the clouds. Not to mention, the sun wasn’t setting. A few months prior the sun would go down at 2:30, now it’s going down around 5:30 like it should. Soon it’ll be going down at 9~10pm. Bahaha! That definitely makes up for the long winter nights. Though, I’m going to feel like it’s winter when I get home, minus the heat, because the sun will feel like it’s setting earlier than it should. But, anyway we saw the poor snowmen dying because the warm weather isn’t friendly to snowmen! Last week I started my new set of COM classes. It’s already much better than the previous class I was taking. This professor not only appears to know what he’s talking about, but he also shows that he at least has some passion in teaching. Not to mention, he’s quite funny. The last set of classes were so unorganized and bland that it hurt to go to class, this new guy is a lot more entertaining and has a much better teaching style. I actually feel like I’ll get something out of this class. And today I got some free food! I was heading to the kitchen to make a peanut butter sandwich when Matthias (the German boy that came back) offered/told me he was going to make me food. So, of course I wasn’t going to say no. I at least helped with cutting onions, potatos, and mashing the potatos, both normal and sweet. So, I didn’t feel bad because I put some effort in too. I’m really a horrible cook. But, luckily our mashed mixed potatos and the salmon with yummy sauce was delicious. Definitely much better than a peanut butter sammich!